The court, while extending house arrest till Sept 24, asked Maharashtra government to file their case diary pertaining to the ongoing probe into the case by that date. The Supreme Court on September 20 reserved its judgment on the public interest litigation (PIL) filed by historian Romila Thapar and others seeking an independent probe by a special investigation team (SIT) into the arrests of five activists in connection with the Bhima-Koregaon violence. A bench comprising Chief Justice Dipak Misra, Justice DY Chandrachud and Justice AM Khanwilkar reserved the judgment following heated arguments advanced by the defence and the prosecution in court room number 1 in the activists’ arrest case in connection with the Bhima-Koregaon violence case and the alleged assassination plot to kill Prime Minister Narendra Modi. The top court asked the Maharashtra government to file their case diary pertaining to the ongoing investigation into the case by September 24, and extended the house arrests of the five activists till then. The court also asked the parties to file their written submissions by then. 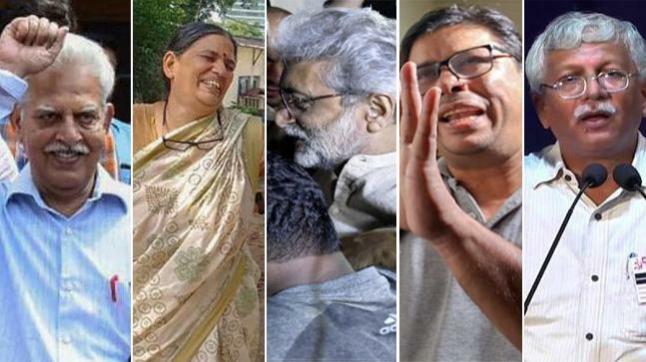 The five activists – Advocate Sudha Bhardwaj, Telugu poet Varavara Rao and activists Gautam Navlakha, Vernon Gonsalves and Arun Ferreira – have been under house arrest since August 29. They were arrested on August 28 by the Pune police for their alleged Maoist links and assassination plot to kill Modi. Their arrest took place nearly three months after the arrest of lawyer Surendra Gadling, Professor Shoma Sen and activists Rona Wilson, Sudhir Dhawale and Mahesh Raut on June 6. According to Salve, a SIT is appointed when those capable of intercepting investigation could derail the investigation. It is to preserve the process in those cases. “Our judiciary is robust. It is competent enough to pull up overzealous officers in case they pick up a wrong person. When is it that the Lordships should appoint an SIT? These days all PILs have a cut-paste prayer seeking to appoint SIT. Based on ideology, you say you can’t trust the government, you can’t trust the Maharashtra police, the NIA (National Investigation Agency)...you can’t trust anything then. Accepting the prayer for petitioners for SIT would mean that we can’t trust the NIA, the CBI (Central Bureau of Investigation) and the police. We see people being framed day in and day out. I don’t know what the material is but if after investigation there is no material, the court is always there to to right the wrong. Calling for SIT because you don’t like the investigation is uncalled for. You throw some muck and seek independent probe,” he concluded. He said the bench had asked the State of Maharashtra to show their best two-three documents from the case diary. “Is this the best they could do? Letters from the case diary are floating in the media that should only be read by the judges in their chambers. Three letters produced by the ASG were admittedly flashed and circulated by the police of Maharashtra in a press conference. No. 2 top police official in Maharashtra [additional director general (law and order)] came in the press conference,” Singhvi submitted. Salve interjected and said that the letters being allegedly distributed by the police could have been done by the petitioners also. CJI Misra quelled the debate. “You have it, use it. We will look into it.” He asked the ASG to explain how the letters found their way to the media. Mehta said that the police told the media that there was some evidence, only showed that certain letters were there. The police showed the media the letter with threat to the PM. Singhvi continued his submission. “The best three documents cited by the ASG against the activists are found on laptops of other persons. But the transit remand applications have no mention of the letters. The transit remand application is based entirely on Bhima-Koregaon and has no mention of the three letters. The Maoist plot finds no mention in any record produced in court. Nobody acts like this in a Maoist plot. No police force in a Maoist plot acts like this. Maoist plot is clearly ex post fact0 endeavour to rope in people,” he submitted. Salve, said Singhvi, represents an intervenor who praises Sambhaji on his Facebook page and is now standing up in court and objecting. Salve interrupted again, to which Singhvi objected by stating, “Interventions, that too by an intervenor.” “How can a man in jail write a letter?” asked Singhvi referring to Professor GN Saibaba, who has been behind the bars in Nagpur Central Jail. Explaining why he is seeking an independent probe, Singhvi argued, “No interrogation took place before arresting my batch of arrestees (those five who were arrested on August 28). Direct arrest. The police discovered a Maoist plot from raids in April and then you act on it in August. The FIR finds no mention of Maoist plot though. You don’t act like this if it’s a Maoist plot against the PM.” “Final word is that prima facie, it’s a cooked up and requires SIT,” the senior counsel concluded. Senior Advocate Anand Grover, appearing for the five activists arrested in June, drew the court’s attention towards “Marathi elements” in the letter written by ‘Comrade Sudha’ (Bhardwaj). “She is a Hindi-speaking person. It shows fabrication. Writing and using Marathi phraseology inherently Maharashtrian. Certain ‘maatras’ are only used in Marathi. Sudha and Rona cannot use those. That is why, I am saying that this case is cooked up.” The apex court reserved the verdict and asked the State of Maharashtra to hand over case diary to the court by September 24.